Looks like there's going to be a chill in the air this coming Summer. 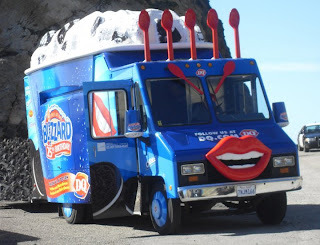 Have no fear...flip flops, shorts & tank tops are still the dress code because this Summer-bound freeze isn't due to the disappearance of global warming but the *arrival* of the Dairy Queen Blizzardmobile! Talk about pimping your ride - the traditional ice cream van is getting the ultimate makeover just in time for the heat & humidity. Love the DQ red plastic spoons as windshield wipers, and the overflowing Blizz popping out of the roof. Me thinks that might be an Oreo Blizzard? The big red lips though...um, DQ might want a rethink. They're kinda scary! Making its way across the US and Canada from April through to August, the DQ Blizzardmobile will be stopping in several cities each day (Yay! Toronto IS on the list - May 18) to celebrate the 25th anniversary of the DQ Blizzard. Spot this ice cream dream on wheels and a special Mini Blizzard treat will be yours. Blizz fans may also get the chance to jump inside the Blizzard Blaster (a huge life size Blizzard cup!) & earn DQ coupons for all sorts of delectable products. Dairy Queen's Facebook page will update the progress of the Blizzardmobile so you won't miss out on any ice cream stalking opportunities. Most importantly of all, if you *do* encounter the DQ crew in your travels, be sure to make a donation to the Children's Miracle Network when you pick up your mini Blizzard -- DQ will be accepting donations for this wonderful charity throughout the tour, plus two of their destinations (Minneapolis, Aug. 5; Calgary, Aug. 12) coincide with Miracle Treat Day, the DQ tradition where a $1 from every Blizz purchased goes to the Children's Miracle Network.